The length was a bit tricky with the shirt tail hem and all. If it was long enough to suit me on the sides, the front and back would hit at an awkward, unflattering, clownish length. 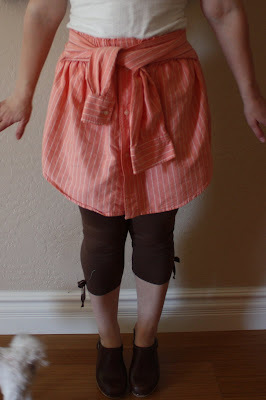 So I chose and ideal length for the front and back, made it a little shorter still and wear it with leggings. I love leggings. I think it has to do with my childhood in the eighties when leggings ruled supreme and yet, I owned not a pair. Those brown leggings are truly my first. The little girl in me smiles really big every time I put them on. True, they are not pink on one leg and purple on the other like the leggings I dreamed of in my tender years, but they fill the void nicely just the same. love it and the leggings. They are fun aren't they. You have cute legs to go in them, mine would just be wrong these days! I have to live that dream through my little ones! Thank goodness it's the one thing Rie loves and will wear and wear! You are so talented! Stacey- Isn't that the whole point of having daughters? So we can live our dreams vicariously through them?